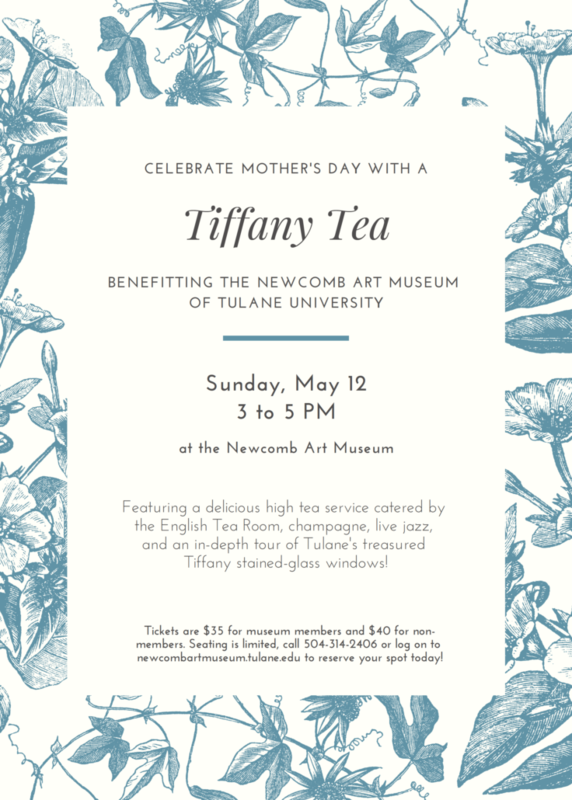 Celebrate motherhood at Newcomb Art Museum’s spring fundraising event, the Mother’s Day Tiffany Tea! Featuring a delicious high tea service catered by the English Tea Room, champagne, live jazz, and an in-depth tour of Tulane’s treasured Tiffany stained-glass windows, this event is guaranteed to be a highlight of your Spring! Honor the special woman in your life in a unique setting and support a treasured New Orleans’ institution at the same time! All proceeds from ticket sales support the programs and exhibitions at the Newcomb Art Museum. Seating is limited, so reserve your spot today!